Conventional wisdom holds that the people of North Korea are trapped in a world of rigid conformity, totalitarian discipline and complete isolation from the rest of the world. But increasingly another picture is emerging: North Koreans are far more aware of the outside world, according to evidence provided by North Korean refugees, South Korean humanitarian aid workers, Chinese traders and others. It is rare for an American to travel to North Korea, and even rarer for an American to spend much time there. Steven Linton has done both. “In general I think North Koreans are clearly growing in their awareness of the rest of the world. I think there’s no question about that,” Linton says. Linton has been going to North Korea for many years. He is engaged in a campaign to combat tuberculosis there, and he says North Koreans are soaking up information about the rest of the world. “One of the most underrated realities about North Korea is its very dynamic relationship with China, and the amount of information that flows across that border. Students; business people; it’s a continuous stream of traffic,” he says. With that traffic come thousands of DVDs, CDs, cellular telephones, used computers and videotapes — many of them from China and South Korea. Kim Heung Kwang came to South Korea from the North six years ago and created a group called North Korea Intellectuals Solidarity. He has his own network of people in both Koreas. Kim says market-oriented traders and smugglers in the provinces of China bordering on North Korea are filling the information gap. He says that many Koreans in China make a living by setting up satellite TVs at their homes to receive South Korean media. Then, they burn CDs and DVDs of the programs and sell them to North Koreans — for a profit, not propaganda. These media are so prevalent inside North Korea now that knowledge about South Korea has become commonplace, says Yoo Ho-yeol, a professor at Korea University in Seoul. Yoo regularly talks to students and refugees from North Korea. “They are telling us that those people living along the border area, all of them know well about South Korean society or daily life,” he says. Groups such as North Korea Intellectuals Solidarity also have managed to send cell phones across the Chinese border, and now thousands of people can call to South Korea, via cell phone systems in China, to provide news of developments inside North Korea. And they can receive text messages, photos and music via cell phones. It was through channels such as these that news leaked out of North Korea late last year of the disastrous currency reform the government had imposed and widespread resistance to it. It is still not risk-free to possess these materials. But, says Kim of North Korea Intellectuals Solidarity, while possessing a videotape from South Korea in years past might bring a three-year prison or labor camp sentence, now the materials are so common that local authorities appear to understand they’ve already lost this battle. “The efforts are ongoing to inspect and collect everything that they can find. But because the demand is so big and the activities are [going on in the] black market, the government is feeling that it is fundamentally impossible to eliminate all sources. So I feel that they are just going through the motion now,” he says. And there is word of mouth. Humanitarian workers from South Korea who have brought medicine or food to North Korea say simple conversation can be transformative. “They saw what we were, and what we do and what we brought. And they go back to [their houses] and they just tell their wives and children and so on. The word spreads, a thousand miles,” Hwang says. Ironically, the policies of the United States can get in the way of the freer flow of information. Some economic sanctions imposed by the U.S. have created problems for the North Korea Intellectuals Solidarity group. It has been sending USB drives that carry books, news articles, music, teaching materials and computer games to North Korea. But North Koreans need more computers to use them, says Kim, the group’s director. “The prerequisite for this program is enough computers in North Korea. But there are several regulations in place blocking our efforts. So I think that the United States needs to change its regulations on these matters,” he says. The number of used computers from South Korea and Japan is enormous. But sanctions make it more difficult to get even these computers and more information into North Korea. The men did all pre-planning and preparation work by working from photographs. But that wasn’t the only obstacle the twin brothers had to overcome. “We experienced low quality electrical power and long hours without electricity,” said Dan McCarty. The language barrier also proved to a challenging, as well as working with a limited number of tools, materials and equipment. “If you don’t have it with you when you arrive, your only option is to improvise while upholding safe practices,” said Dennis McCarty. But the brothers didn’t let anything stand in their way. The project was pronounced a resounding success by North Korean’s hospital directors. All three power systems are operational and are currently in service. The latest food aid from the United States to North Korea, comprised of 25,000 tons of corn and other grains, has made its departure from the U.S. state of Virginia, a U.S. radio station reported Saturday. The Mary-Ann Hudson, a U.S. cargo vessel carrying 20,000 tons of corn and 5,000 tons of beans, left from Norfolk, Virginia, on Friday and is scheduled to arrive at North Korea’s western port of Nampo on Nov. 18, Radio Free Asia reported, citing a spokesperson of World Vision. In June, the U.S. started shipping the first batch of some 500,000 tons of food aid, which it pledged to deliver to the North over a year-long period, through the World Food Programme (WFP). Previous shipments were organized by the WFP, but the latest round is conducted jointly by relief organization World Vision and four other relief agencies, according to the spokesperson. A fourth shipment of U.S. food aid for the Democratic People’s Republic of Korea sails this week to be distributed by five humanitarian agencies delivering urgent assistance to North Koreans suffering from severe food shortages. The commodities are scheduled to arrive before winter. More than 894,000 of North Korea’s most vulnerable people – mainly children, pregnant and nursing mothers, and the elderly – will receive daily rations from this shipment of 25,060 metric tons of bulk corn and soy. The distributions are conducted in two North Korean provinces, led by Mercy Corps with World Vision as co-lead. Samaritan’s Purse, Global Resource Services and Christian Friends of Korea are the partner agencies. On arrival at the western port of Namp’o in the latter half of November, the food will be rationed to recipients through public distribution centers, orphanages, school, hospitals and nurseries in Chagang and North Pyongan Provinces. The program, funded by the U.S. Agency for International Development’s (USAID) office of Food for Peace, is the first U.S. food assistance program for North Korea since 2000. The NGO partnership is on track to distribute 100,000 metric tons of the food aid during the year-long program, reaching 895,000 people, while the World Food Programme (WFP) is distributing another 400,000 metric tons in U.S. assistance. This week’s shipment is the first one entirely allotted for the NGO partnership to dispense. The lack of food in North Korea became severe this year as floods devastated harvests, China erected barriers to food exports, and prices skyrocketed globally for staples such as rice and maize. In a June 2008 assessment, a team of experts from the partner agencies confirmed findings of food shortages and acute needs in North Korea. Malnourishment was prevalent, rations were reduced, and food stocks were dwindling. Separately, the WFP projected a shortage of 1.66 million metric tons of food, relative to the population’s needs. The U.S. food assistance program includes clear provisions for monitoring distributions and conducting ongoing needs assessments. The partnership of humanitarian agencies has a staff of 16 based in the DPRK for the duration of the program to monitor activities continually and conduct random visits to distribution points. Mercy Corps works amid disasters, conflicts, chronic poverty and instability to unleash the potential of people who can win against nearly impossible odds. Since 1979, Mercy Corps has provided more than $1.5 billion in assistance to people in 106 nations. World Vision is a Christian humanitarian organisation dedicated to working with children, families and their communities worldwide to reach their full potential by tackling the causes of poverty and injustice. We serve all people, regardless of religion, race, ethnicity or gender. Samaritan’s Purse provides immediate, no-red-tape response to the physical and spiritual needs of individuals in crisis situations, especially in locations where few others are working. The organisation is working in more than 100 countries to provide aid to victims of war, disease, natural disaster, poverty, famine and persecution. Global Resource Services is dedicated to going beyond charity to find real solutions to complex global crisis where peace and security are in jeopardy. Our mission is driven by an end vision of reconciliation. Relationships, respect and reconciliation are the common threads that empower our cause. Christian Friends of Korea (CFK) has been working since 1995 to bring hope and healing to the people of North Korea. To date, CFK’s efforts to build trust and relationships and meet real human needs at tuberculosis and healthcare facilities have resulted in the delivery of over $35 million USD in humanitarian assistance to the DPRK. Five aid agencies today announced that they have signed an agreement with the Democratic People’s Republic of Korea to deliver U.S. government food assistance to North Koreans suffering from severe food shortages. The partnership will distribute 100,000 metric tons of food to more than a half-million needy people over a twelve-month period. Mercy Corps is leading the programme, with World Vision as co-lead, pending final agreement. 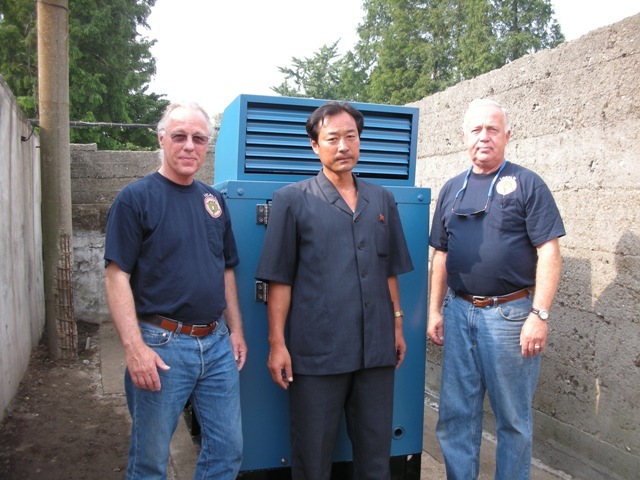 Partner agencies are Samaritan’s Purse, Global Resource Services and Christian Friends of Korea. Daily rations will be provided for approximately 550,000 vulnerable people – mostly children, the elderly and pregnant and nursing women – in two North Korean provinces. The programme, funded by the U.S. Agency for International Development’s (USAID) office of Food for Peace, is the first U.S. food assistance programme for North Korea since 2000. Mercy Corps is taking the lead in a yearlong distribution of 100,000 metric tons of food to quell rampant hunger in North Korea. We have been asked by the U.S. government to spearhead a partnership of five non-governmental organizations (NGOs) that will implement a major food assistance program for North Korean families. Distribution of the food aid – provided by the U.S. government and funded by the U.S. Agency for International Development’s (USAID) Food for Peace program – is taking place over the course of twelve months beginning in June 2008. Alongside our partner organizations, we will distribute food such as cereal grains, vegetable oils and beans through schools, hospitals, orphanages and other institutions. Our food distribution programs are expected to reach more than 550,000 people – primarily children, the elderly and the extremely poor – in two provinces. We will have staff residing in North Korea to visit families, monitor distribution and assess impact. Since 1996, Mercy Corps has promoted cross-cultural exchange and worked with the country’s vulnerable families and communities to help meet health and nutritional needs, as well as collaborate on long-term agricultural and economic solutions. Our late co-founder, Ells Culver, reached out to the North Korean people in the aftermath of drought, flooding and food shortages. That cooperation was strengthened last year when we hand-delivered $13 million of medicines for flood survivors, and earlier this year when we received a USAID grant to install emergency generators and medical equipment in six county hospitals. Your gift to our Global Food Crisis fund will help us deliver assistance to even more families in some of the world’s most challenging places. To learn more, visit their website (link). North Korea’s foreign minister Friday met with a U.S. delegation bringing emergency medical supplies to help North Korean victims of recent floods, the North’s official news outlet said. The reclusive country has appealed to the international community for assistance to cope with massive flooding caused by heavy downpours that left at least 600 people dead or missing and about 100,000 people homeless in early August. The United Nations is seeking US$14 million to provide North Korea with food, medicine, drinking water and other emergency goods. “Foreign Minister Pak Ui-chun met with guests from the United States who visited with emergency medical aid equipment donated by the U.S. administration and the non-governmental organization Samaritan’s Purse with regard to flood damage at the Mansudae Assembly hall,” said the one-sentence report carried by the Korean Central News Agency. It did not identify the U.S. guests. Washington has so far pledged US$100,000 for the U.N. initiative, equally distributing the funds to two non-governmental relief organizations, Mercy Corps and Samaritan’s Purse, to deliver emergency aid to North Korea. The heaviest rain in 40 years swept North Korea, which is poorly equipped to cope amid wide-spread deforestation. The severe damage caused the second inter-Korean summit to be postponed from late August to early October. The United States is providing 100,000 dollars in humanitarian aid to flood-stricken North Korea, the State Department said Friday. The US Agency for International Development (USAID) would provide 50,000 dollars each to two US non governmental organizations operating in North Korea — Mercy Corps and Samaritan’s Purse, department spokesman Sean McCormack said. “The intention is that the money would be used to provide blankets, shelter materials, water containers and other supplies to those in need,” he told reporters. Almost 300 people were dead or missing in the North Korean floods, according to an aid agency quoting official figures in the nuclear-armed hardline communist nation. Official media in the reclusive state has painted a grim picture of inundated crops and homes, flooded factories and mines and washed-out roads. UN agencies said on Friday that half of North Korea’s main health centres have been submerged by floods and warned that the situation in the country could deteriorate unless aid arrives rapidly. The United States, together with China, Russia, Japan and South Korea, have promised to provide the North Koreans aid and security and diplomatic guarantees if it scraps its nuclear weapons program. But any flood relief provided by the United States would not be linked to a planned gradual shipment of one million tonnes of fuel or its equivalent to North Korea if it completely dismantles its nuclear weapons program, McCormack had said. North Korea has already got 50,000 tonnes of fuel aid for closure of its key nuclear reactor under the six-party nuclear talks. Wayward Food Aid in North Korea? It is a question that policymakers in the Bush administration, other governments, and private relief agencies have pondered for years: How much of the considerable international food aid sent to hungry North Korea has been diverted away from its intended beneficiaries? The debate is not likely to end, but a significant study released this month by the U.S. Committee for Human Rights in North Korea takes a stab at an answer: 25 to 30 percent of it. However, say the report’s authors, that diversion may not be the disaster it initially seems to be. Much of the redirected aid appears to move back into North Korea’s nascent food markets, where it is available to people who have earned the outside income to afford it. The diversions do not appear to be centrally directed but rather reflect the actions of North Korean agencies and people who are seeking financial gain, say the report’s authors, Stephan Haggard, director of the Korea-Pacific Program at the University of California–San Diego, and Marcus Noland, a senior fellow at the Washington-based Institute for International Economics. The 56-page report (“Hunger and Human Rights: The Politics of Famine in North Korea”) is released at a sensitive moment: Talks among six nations, including North Korea, aimed at persuading the North to abandon its nuclear weapons programs are scheduled to resume today. Pyongyang delayed the resumption of the talks by some two weeks, saying it was reacting to the naming of a U.S. official to focus on human rights problems in the North and to U.S.-South Korean military exercises. The regime will undoubtedly be watching for any moves to back away from international aid commitments to feed the hungry in the nation of 23 million. North Korea has suffered food shortages for well over a decade, and a famine in the mid- and late-1990s is believed to have killed up to 1 million people–though some estimates have put the figure higher. The public food distribution system staggered under the problem, and many North Koreans are now purchasing much of their food in markets, spending upwards of 80 percent of their income on food. North Korea has received more than $2 billion in food aid over the past decade, the U.S. contribution rising above $600 million of that. The United Nations World Food Program has not been able to meet its food contribution goals this year, a reflection, some analysts say, of international annoyance with North Korea’s stance on nuclear issues. The report cites what Haggard describes as regime efforts at “systematically blocking NGO [nongovernmental organizations] aid.” Barriers include North Korean limits on the number of food-aid monitors allowed to follow distribution, preventing the WFP from deploying Korean-speaking staff, putting several counties (with 15 percent of the population) off limits, and requiring that inspection visits be announced ahead of time. All of that, the authors suggest, worsens the problem of aid being misdirected. Further, says Haggard, the North Koreans cut commercial imports nearly in tandem with growing food aid from other countries. The meaning: “The North Korean regime was using food imports as a sort of balance-of-payments support,” he says. But no one should expect quick fixes to the challenge of verifying that aid to the North goes where it should be going. “Absolute control is not possible,” Ells Culver, a cofounder of Oregon-based Mercy Corps, said in a recent interview with U.S. News. Mercy Corps is assisting with several agriculture projects in the North. “We’ll never get as much monitoring as in other countries.” Such pragmatism, however imperfect it is, may be the best approach to helping North Korea’s hungry. You are currently browsing the archives for the Mercy Corps category.